Under the Gold Fields Act 1858 all miners needed to hold a miner’s right to permit them to legally mine for gold. 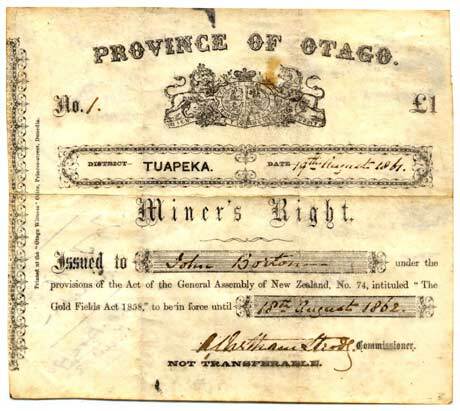 In August 1861 Alfred Chetham Strode was appointed commissioner of the Tuapeka goldfield in Central Otago, and issued this first miner’s right to his brother-in-law, John Borton, for the sum of £1. With 2,000 diggers at the Tuapeka goldfield at the time, commissioners had their hands full managing disputes and resolving miners’ grievances.